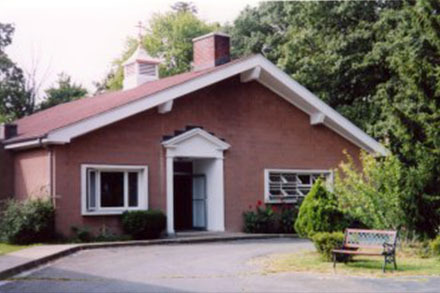 The Adult Home of the Russian Orthodox Convent Novo-Diveevo was founded in 1972 by Archbishop Andrei of Rockland to provide care of the elderly persons of Slavic background. Archbishop Andrei felt that it was important to provide care for the elderly who due to the lack of proper knowledge of the English language would otherwise feel isolated in an environment of an English speaking adult home. The Adult Home is fully accredited, licensed by New York State and staffed around the clock. The 76-bed facility is nestled on the grounds of the Convent. The Home provides each resident with a private, furnished room, complete with a bed, dresser, desk, two chairs, night table, lamp, draperies, and a wall closet. New residents may bring their own furniture if they wish. A television, radio, small refrigerator, and telephone are permitted in the rooms. The Convent grounds offer an ideal opportunity for walks in the fresh country air amidst natural beauty. The staff is fluent in most Slavic languages providing or arranging services for all of our residents. Residents enjoy three meals a day, cooked on premises and prepared in a traditional Slavic style, meeting the nutrient requirements set by the New York State Health Department. Special diets are provided when ordered by a physician. Complete housekeeping services are provided at the Home, including linen service and laundering of resident’s personal clothing. Office staff is available for case management services. A full medical staff visits the Adult Home regularly and is on call 24 hours a day. Care includes a periodic physical examination for all residents. The convent physician visits the Home twice a week. Nurse’s aides and staff provide 24-hour supervision. Medical prescriptions are filled by our local pharmacy and when necessary a nurse’s aide can provide assistance in taking medications. Physical Therapy is also part of the care. The Home also arranges appointments and transportation to other medical providers when needed. Residents are welcome to attend the convent church, which has religious services twice daily. For those residents who wish to attend, but cannot due to physical restrictions, the services are broadcast live to specific areas of the Adult Home. A priest visits the home at least once a day and is available for private meetings with the residents per request. Engaging weekly activities are provided for all the residents. All residents are encouraged to participate but are not required to do so. Activities that occur on a weekly or bi-weekly basis include coffee hour, movies and concerts. Group discussions of current events as well as reading sessions of religious, non-fiction and popular novels are held. Movies, often times are geared toward Slavic speaking residents and their special interest. Games and music appreciation sessions are also held, as well as other entertainment.